Prime Minister Benjamin Netanyahu accused Iran’s ayatollahs of “planning a new genocide” against the Jewish people and vowed to prevent Tehran from developing nuclear weapons. During a speech on International Holocaust Remembrance Day Tuesday, Netanyahu said that his duty as PM was to “ensure that the State of Israel will never again be threatened with destruction,” and that the agreement being negotiated between the P5+1 world powers and Iran did just that. “The ayatollahs in Iran, they deny the Holocaust while planning another genocide against our people. The Jewish people will defend itself by itself against any threat. That’s what the Jewish state is all about,” he went on. Along with the assault and vilification of Jews in Europe, the Mideast and the West, Netanyahu said Israel was also being “assaulted with the same slurs and libels that have been leveled at the Jews since time immemorial. Netanyahu epitomizes the paranoid, delusional Jew, always imagining that some evil "anti-Semitic" bully is out to get him and his kinsmen for no reason. This is a typical trait of Jews, which is promoted and reinforced by the organized Jewish community at every possible opportunity. They believe they are the eternal victim, persecuted and scapegoated where ever they go for no reason other than the fact they are Jews. Their behavior and actions have nothing to do with "anti-Semitism," and a second "Holocaust" is always on the horizon. More than a thousand people trekked across Iran this past week to visit a shrine in this ancient Persian city, a pilgrimage like many others in the Islamic Republic — until you notice men there wearing yarmulkes. Iran, a home for Jews for more than 3,000 years, has the Middle East's largest Jewish population outside of Israel, a perennial foe of the country. But while Iran's Jews in recent years had their faith continually criticized by the country's previous governments, they've found new acceptance under moderate President Hassan Rohani. ... since Rohani took office last year, Jews say they have been heartened by the support they've received. His government agreed to allow Jewish schools to be closed on Saturdays to mark Shabbat, the day of rest. Rouhani also allocated the equivalent of $400,000 to a Jewish charity hospital in Tehran and invited the country's only Jewish lawmaker to accompany him to the United Nations General Assembly in New York last year. Netanyahu's utterly delusional statements come at a time when Jews are ensconced in the most important and influential positions of power and influence in Western society. The organized Jewish community essentially has a lock on American politics and elections, and they outright control or heavily influence a number of important sectors and institutions of the U.S. economy and political establishment, including the mainstream mass media, Wall Street, and the Federal Reserve System. The Western world, particularly the United States, provides the Jewish state of Israel unwavering political, financial, and diplomatic support, no matter the circumstances. Criticizing or even pointing out Jewish power and influence in the West, challenging their interpretation and narrative of history and modern events, and criticizing the Jewish state of Israel are easily the greatest social taboos of our times. The Iranian government has repeatedly made clear that they have no desire to start a war against Israel, and are certainly not interested in "exterminating" the Jews, as Netanyahu would have people believe. What Netanyahu and other prominent and influential leaders in the organized Jewish community do have to fear is an increased public awareness of just who the Jews are, what their agenda is, what outrageous, unforgivable crimes and atrocities they have committed, and how they have influenced and shaped American society and politics. When the Jewish spell over the Western world is finally broken, Netanyahu and his international Jewish mafia will be in big trouble. Last night, I was a guest on The Jeff Rense Program on the Rense Radio Network. We discussed the 70th anniversary of the "liberation of Auschwitz," the fake "Holocaust" narrative of WWII, efforts to criminalize "anti-Semitism" on an international level, and organized Jewry's power and influence in Western society. You can download the entire program here. The Anti-Defamation League (ADL) welcomed today’s United Nations General Assembly (UNGA) informal plenary session on the rise in anti-Semitic violence worldwide, noting the importance of the body’s “long overdue” recognition of the urgent need to address the increasingly tragic consequences of the rise of anti-Jewish animus around the world. As I've mentioned in previous blog posts here, combatting "anti-Semitism" and implementing the "lessons from the Holocaust" became the main pillars of Western social and cultural thought following WWII, which Foxman's statement reflects. The anti-White, anti-national Marxist ideas of "diversity," "tolerance," and "multiculturalism," fully institutionalized throughout the entire Western world, are a direct outgrowth of the "Holocaust" promotion industry specifically and organized Jewry generally. These ideas are a bedrock of the New World Order agenda, which is and has always been promoted and advanced primarily by international Jewry. [...] With Israel leading the way, 37 nations called on the UN to respond to the sharp spike in violent anti-Semitism around the world. The UN missions of the US, Canada and those of all 28 members of the European Union partnered with Israel to bring about the informal meeting. ‬“It says a lot that so many countries have partnered with Israel to raise this issue of anti-Semitism to the top of the UN’s agenda. We have a great deal of work to do to move this issue from the headlines to the history books,” said Ron Prosor, Israel’s ambassador to the United Nations. But because it was an informal meeting, the only action the assembly could take was to issue a joint declaration. So far, more than 40 countries have signed the statement. “The United Nations must step forward and play a pivotal role in combating anti-Semitism as well as intolerance, discrimination and violence based on religion of belief. It is a moral imperative for this institution to call on governments around the world to promote tolerance and mutual respect in their societies,” according to the statement. The statement urged all nations to “declare their categorical rejection of anti-Semitism,” strengthen laws to combat discrimination, and prosecute those responsible for anti-Semitic crimes. Many Jewish groups welcomed the declaration, but want the UN to take more specific action. “Meetings and speeches aren’t enough. The results of this gathering must be concrete. 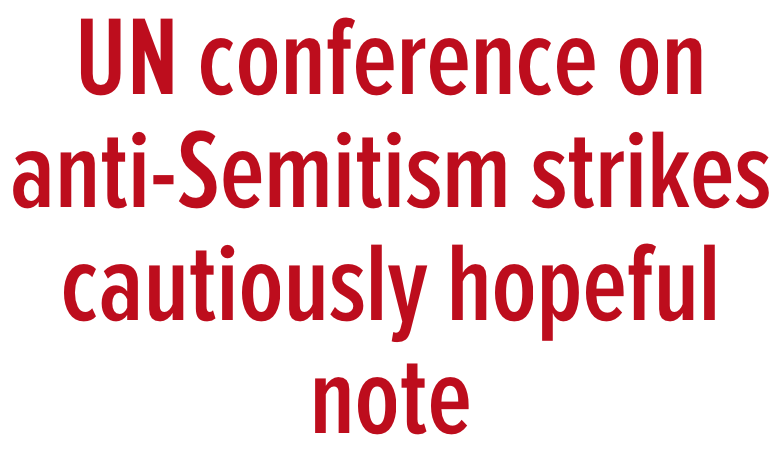 All states should resolve to crack down on anti-Semitism, and not to allow it to carry on under the guise of debate about Israel,” said Jonathan Sacerdoti, director of communications for the UK-based Campaign Against Antisemitism. “Without the Jews of Europe, Europe would no longer be Europe,” he warned, echoing a statement made by French PM Manual Valls after the kosher market killings on January 9 that France would no longer be France without French Jews. Roth and Desire called for a new legal framework at the European Union and internationally to address the diffusion of racist and anti-Semitic speeches and material. The Jews are demanding action, and the traitors controlling the governments of both France and Germany are openly calling for legal measures at the international level to "address the diffusion of racist and anti-Semitic speeches and material," which really amounts to criminalizing all speech and ideas the Jews do not like. The Jews are moving to further solidify their protected minority status not only in Europe, but around the world. Since the actual definition of "anti-Semitism" is simply making accurate statements and observations about Jews, the Jewish state of Israel, and the international Jewish agenda, what is being proposed here is, plainly put, the criminalization of the truth about Jews. This may be the most Orwellian development since the implementation of laws punishing "Holocaust denial" in various European countries. Below are the first two videos, found over at The Daily Stormer, in an ongoing series entitled, "The Goy Guide to World History." In the videos, Dr. E. Michael Jones, a Catholic historian and publisher of Culture Wars magazine, expounds upon his book The Jewish Revolutionary Spirit and Its Impact on World History. Although I do not entire endorse or agree with everything Dr. Jones states, these videos are excellent and certainly worth watching. Are Jews "part of the West"? Jared Taylor makes many important points, namely the fact that Israel is a racial state (i.e., a Jewish state), which is endorsed and supported by the West, especially the United States. However, the Western political and media establishment are strongly against a racial state in their own countries. Israel is allowed to be a Jewish state, but America, Europe, and the rest of the Western world must be "proposition nations", where individuals of all racial, ethnic, and religious backgrounds can become citizens. Massive non-White immigration (legal and illegal), multiculturalism, and racial diversity and intermixing is encouraged and supported by the Western political and media establishment - in fact, it is state policy. And yet, Israel is supported and accepted as a racialist Jewish ethno-state. One policy for the West (multiculturalism, diversity, massive non-White immigration, deracination for Whites, etc. ), quite another for the Jews (Jewish state, strong Jewish identity and cohesion, virtually no non-Jewish immigration, discrimination against non-Jews, etc.). The hypocrisy is astounding and unacceptable. In typical fashion, what Jared Taylor fails to expound upon is that the fact that the leading proponents of "diversity" and "multiculturalism" (i.e., White displacement and disenfranchisement) in the West emanate from the organized Jewish community, and always have. Indeed, radical Jewish intellectuals and political activists have led a systematic assault on traditional Western civilization and identity, as Dr. Kevin MacDonald has expertly analyzed and documented in his book The Culture of Critique: An Evolutionary Analysis of Jewish Involvement in Twentieth-Century Intellectual and Political Movements. Is Jared Taylor unfamiliar with Dr. MacDonald's work? Does someone with the knowledge and experience that Jared Taylor has really think that Jews "consider themselves men and women of the West"? Does Taylor seriously believe that Jews "think of themselves as heirs not only to a Jewish tradition, but to a European tradition"? When Jews think of the West, what do they think of? They think of "anti-Semitism", persecution, bigotry, intolerance, hatred, racism, and Christianity. The Jews abhor the people, culture, traditions, and history of the West, and have been waging war against it for centuries now. When is Jared Taylor going to recognize this obvious fact, and say it out loud? "So-called democracy exists in this Angle-French world, which means the rule of the people by the people. Now, the people must possess some means of giving expression to their thoughts or their wishes. Upon examining this problem more closely, we see that the people themselves have no original convictions of their own. Their convictions are formed, of course, just as everywhere else. The decisive question is who enlightens the people; who educates them? Capital actually rules in those countries; that is, nothing more than a clique of a few hundred men who possess untold wealth and, as a consequence of the peculiar structure of their national life, are more or less independent and free. They say: 'Here we have liberty.' By this they mean, above all, an uncontrolled economy, and by an uncontrolled economy, the freedom not only to acquire capital but to make absolutely free use of it. That means freedom from national control or control by the people both in the acquisition of capital and its employment. This is really what they mean when they speak of liberty. ... It is self-evident that where this democracy rules, the people as such are not taken into consideration at all. The only thing that matters is the existence of a few hundred gigantic capitalists who own all the factories and their stock and, through them, control the people. 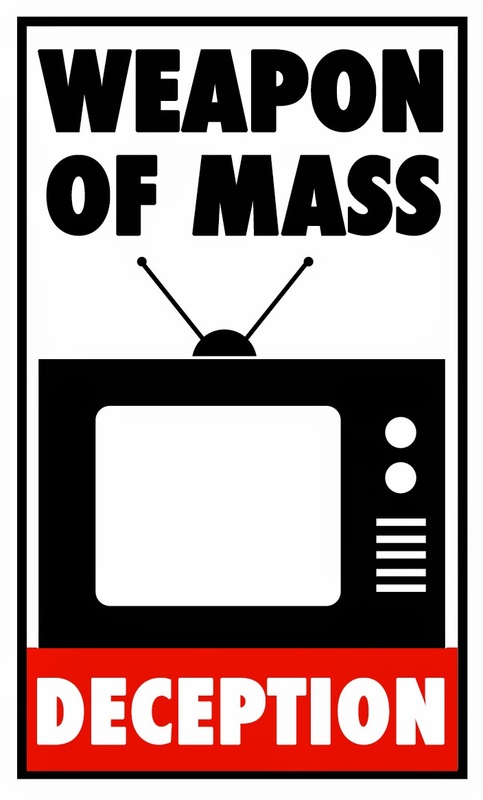 The masses do not interest them in the least. They are interested in them just as were our bourgeois parties in former times - only when elections are being held, when they need votes. Otherwise, the life of the masses is a matter of complete indifference to them..."
The Times of Israel recently ran a story offering readers a glimpse into a powerful, and quite effective, hasbara organization operating in the heart of Washington, DC. The Israel Project, which has a $7.5 million annual budget, "is passionately committed to Israel and the Jewish people," according to associate dean of the Simon Wiesenthal Center, Rabbi Abraham Cooper, who was quoted in the article. Josh Block is a frenetic, sharp-tongued, non-stop PR machine with a preternatural ability to spit out facts and figures that bolster the case of the Jewish State. Since 2012 he has been the president and CEO of The Israel Project, a Washington, DC-based pro-Israel organization that has grown to mirror his personality: it is a fast-paced, single-minded war room pumping out pro-Israel memes, fighting Israel’s detractors in cyberspace, conducting polling and research, and helping to arm what Block calls “a pro-Israel social media army." To equip this virtual militia, The Israel Project has a rapid response team dedicated to producing infographics, videos, and other shareable products that are suited to modern channels of communications. During Israel’s summer 2014 war in Gaza, its infographics, like the Timeline of Hamas Terror, were ubiquitous across social media platforms. Block says the rise of social media and online journalism in the past decade has transformed the way influence in Washington is wielded and the pro-Israel community has been too slow to respond. Block says the anti-Israel community is taking advantage of this “transparency revolution” more quickly, and in a more sophisticated way, than Israel’s defenders. 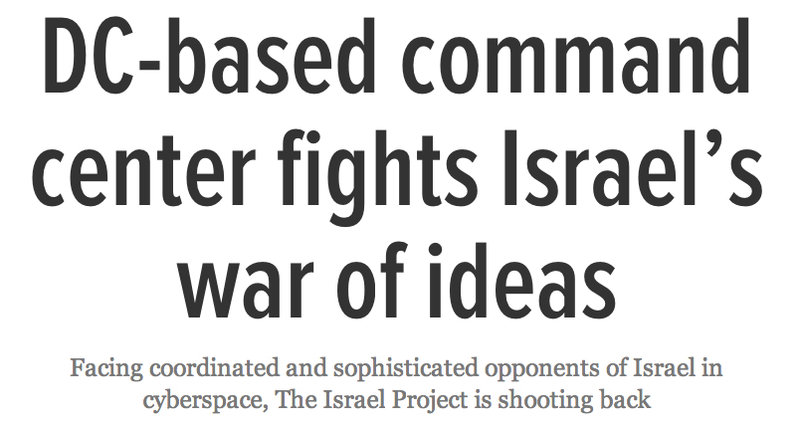 The way it works, he says, is that the interconnected “self-referential network” of anti-Israel bloggers introduces a piece of information online, and then moves it across the system closer to the mainstream, where it will get “laundered” by the UN, an NGO, or think tank. Eventually, Block says, even the most vile and absurd accusations against Israel will be considered legitimate discourse. Public relations guru Steve Rabinowitz knows how to frame a narrative. A former communications staffer in the Bill Clinton White House, Rabinowitz is a veteran PR consultant with past ties to liberal groups like J-Street and the Reform movement. His current clients include many of America’s leading Jewish organizations. Later in the article, Block brags that his organization has "affected over 100 stories in The New York Times this year, 99 in the Washington Post, and 75 in the Associated Press." I know I'm basically repeating myself at this point, but I'd like to make a couple points about this revealing article. First off, can anyone deny the immense power and influence the organized Jewish community has in America today? The Jews essentially have a lock on American politics and mass media. Even the mildest criticism of the Jewish state of Israel is hysterically denounced as "anti-Semitism," with armies of hasbara trolls and agents spewing the pro-Israel line. Jewish and other pro-Israel propagandists are regularly featured on television and radio news programs, published in online and print news reports, and dominate the Op-Ed columns appearing in the most influential news outlets in both the traditional print media as well as the more modern, online-based news media. No one dares to even discuss, let alone mention, the power and influence of the organized Jewish community, as opposed to the Jewish state of Israel, in mainstream, polite (i.e., politically correct) society. Criticism of the Jewish state of Israel has appeared, in very limited, watered down manifestations, in the mainstream mass media, simply due to the blatant and egregious war crimes and barbaric military campaigns the Israelis have committed and carried out in recent years. Secondly, notice that, once again, we have a high profile Jew openly admitting that the "pro-Israel community has been very successful at lobbying and politics," as Steve Rabinowitz states in the article. He goes on to explain that the organized Jewish community has "made great investments in think tanks and organizations that promote Jewish identity and continuity," and emphasizes the need for the Jews to adapt to the digital age to maintain their monopoly on the political and historical discourse in America (and the wider Western world for that matter). If I, or anyone else, were to state the obvious - that Jews have "been very successful at lobbying and politics" in America - we would be denounced as "hateful anti-Semitic bigots." Finally, the hypocrisy and double standards of the organized Jewish community is simply astounding. They openly organize, quite successfully, to promote their racial interests, which includes the interests of a foreign state. They work with, encourage, and finance other "minorities" - who are fast becoming a majority in America and the Western world - to organize to advance their particular racial interests. However, Whites are not allowed to organize along racial lines, let alone identify with their racial heritage (at least politically), as that would be "racist" and "hateful." How these basic facts can go unnoticed by the masses still amazes me. "Terrorist attacks" in France designed to perpetuate "Global War on Terror"
Israeli Prime Minister Benjamin Netanyahu wasted no time exploiting the recent alleged "terrorist attacks" in Paris in order to perpetuate the Jewish concocted "Global War on Terror" paradigm of international relations, which has been officially institutionalized in the West following the events of 9/11. Prime Minister Benjamin Netanyahu on Monday visited the kosher supermarket in eastern Paris where four Jews were killed by an Islamist gunman who stormed the store last Friday, warning that attacks could grow worse. Arriving to the cries of “Bibi, Bibi” — his nickname — and under massive security protection, Netanyahu paid tribute to the victims at the site, and was accompanied by Foreign Minister Avigdor Liberman. Netanyahu called on European leaders to support Israel in its own fight against terror, likely a reference to European criticism of Israel regarding its conflict with the Palestinians. Netanyahu arrived in Paris for Sunday’s mass rally in commemoration of the 17 victims of the Paris terror attacks at the Charlie Hebdo satirical magazine and HyperCacher market, as well as the shooting death of a policewoman. Netanyahu later gave an address in Hebrew at the Grand Synagogue in Paris where he thanked France for its “very firm position” against anti-Semitism. “Our common enemy is radical, extremist Islam — not normal Islam,” Netanyahu said in an address at the Grand Synagogue in Paris, after briefly joining other world leaders in a mammoth march against extremism through the capital that drew up to 1.6 million people. Netanyahu called on Europe and the rest of the world to support Israel’s fight against terror. “Israel is today at Europe’s side, but I would like Europe to be on Israel’s side too,” Netanyahu said. “Those who killed and massacred Jews in a synagogue recently in Israel and those who killed Jews and journalists in Paris are part of the same global terror movement,” he added, referring to a deadly November attack at a synagogue in the Jerusalem neighborhood of Har Nof. The prime minister asserted that the danger imposed by global terror had the potential of deteriorating into a serious threat to all humankind if radicals were to achieve nuclear capabilities. He then demanded of world powers to thwart Iranian nuclear aspirations. Netanyahu went on to once again extend an invitation to French Jews to emigrate to Israel, just a day after he said the Jewish state was their home. Netanyahu also called on world leaders "to take a more forceful stand against radical Islam" while giving a speech at the funerals for the alleged victims of the attacks at the kosher supermarket in Paris, according to The Jerusalem Post. Given the incredibly phony and quite ridiculous nature of the alleged "terrorist attacks" in Paris, I think it is safe to assume these events were created by the mass media and intelligence agencies in an effort to perpetuate the tyrannical and Orwellian "Global War on Terror" paradigm, in which the entire Western world is engaged in a never ending war against a faceless, manufactured enemy known as "radical Islam". French PM: "France without Jews is not France"
A France bereft of 100,000 Jews would be deemed a failure, the country’s prime minister said last week, before a terror attack on a kosher market left four Jewish men dead and spurred renewed calls for immigration to Israel. Manuel Valls told The Atlantic’s Jeffrey Goldberg that “France would no longer be France,” if Jews fled the country en masse, in an interview published early Sunday. “100,000 French people of Spanish origin were to leave, I would never say that France is not France anymore. But if 100,000 Jews leave, France will no longer be France. The French Republic will be judged a failure,” he said. Valls echoed the statement on Saturday outside Paris’s HyperCacher market, calling for a millions-strong march against terror a day after an Islamist gunman killed four men and held several more people hostage before being killed by police. However, Valls said before the attacks that the French Republic had been founded on equal rights being extended to Jews, but that was being threatened with an admitted rise in anti-Semitism coming from an influx of Muslim immigrants. Valls, though, indicated that French Jews should be shown they do not need to flee the country. “The Jews of France are profoundly attached to France but they need reassurance that they are welcome here, that they are secure here,” he said. Isn't France supposed to be the home of the French people? Why would France be "a failure" if all the Jews left for Israel, the self proclaimed Jewish state? It would be deemed a failure by France's ruling class because, as French Prime Minister Valls indicated in the article above, the French Republic was founded on equal rights being extended to Jews, and eventually other non-French, non-White peoples living in and immigrating to France. Following the French Revolution, Marxist-Masonic ideas of nationality came to dominate the Western world, first in France and later the entire Western world, particularly after the defeat of National Socialist Germany in WWII. Since the founding of the French Republic, racial or ethnic nationalism (i.e., blood and soil nationalism) has been replaced with the nation-destroying concepts of civic nationalism, multiculturalism, and diversity, which were then used by organized international Jewry and their Masonic henchmen to subvert and ultimately destroy the traditional White Western Christian nations in Europe and European-derived nations around the world, such as the United States, Canada, and Australia. Hence, you have millions of African and Muslim "Frenchmen" living in France now, a ridiculous spectacle no rational person could possibly explain or justify. No doubt the Jewish lobby in France will now be asking for more money from the French state for "security" and other services following the latest "terrorist attacks" purportedly carried out by Islamic extremists. On a side note, I have to say that I find the official story, as depicted by the mass media and political establishment, of these alleged events extremely bizarre. Are these alleged "massacres" merely staged events designed to perpetuate the fraudulent "Global War on Terror" and justify even more crackdowns on basic Western freedoms? I certainly would not be surprised. It's finally time to break the spell! I recently read Dr. Nick Kollerstrom's excellent book Breaking the Spell - The Holocaust: Myth & Reality (available from The Barnes Review), published just last month, which includes an important Forward authored by Dr. Jim Fetzer. Dr. Kollerstrom appeared on The Realist Report in October of last year, where we focused primarily on his research into the 7/7 "terrorist attacks" in London - yet another fraudulent event blamed on "radical Islamic terrorists" designed to reinforce and perpetuate the Jewish concocted "Global War on Terror" institutionalized in the United States and the wider Western world following 9/11. Dr. Kollerstrom has written what many regard as the most authoritative study of the events of 7/7, published as a book entitled Terror on the Tube: Behind the Veil of 7/7, an Investigation. However, his recent book dealing with the fanciful Jewish "Holocaust" narrative of WWII may prove to eclipse his previous work, in my opinion. Breaking the Spell - The Holocaust: Myth & Reality is a well-written and well-researched treatise entirely and conclusively debunking the official "Holocaust" narrative endlessly promoted and perpetuated by the mainstream mass media, Hollywood, the Western political and educational establishment, and the organized international Jewish community. The book also touches upon a variety of other important issues as well, all of which relate directly to the false "Holocaust" story, including the concept of free speech, intellectual integrity, critical thinking, and the future of humanity. "I say there cannot be a happy future for mankind," Dr. Kollerstrom courageously declares, "so long as this nightmare delusion that people call 'The Holocaust' remains in place." Dr. Kollerstrom explains to his readers the manner in which he was expelled from University College, London for simply asking questions and doing research into the alleged Jewish "Holocaust" during WWII. As Dr. Kollerstrom knows all too well at this point, thinking critically and questioning the official "Holocaust" narrative of WWII is strictly verboten in Western society. However, those who do so quickly discover that the official narrative regarding the alleged Jewish "Holocaust" falls apart rather easily, as regular readers fully understand. One thing that struck me again and again as I read this book was the fact that historical revisionists - those asking the tough questions, demanding answers, thinking critically about WWII and the official narrative we've all been indoctrinated into blindly accepting - really do embody and stand for Western philosophical and intellectual traditions. Revisionists champion critical thinking, skepticism, scientific and rational thought, and never shy away from open debates or discussions. "Holocaust" promoters, on the other hand, are the exact opposite. Their worldview, their philosophical and intellectual standards and values, stand in stark contrast to revisionists. The "Holocaust" promoters are dogmatic, unscientific, illogical, and truly anti-intellectual. They scorn free speech and thought, demanding slavish obedience to the ridiculous and quite fanciful narrative they've concocted, institutionalized, and perpetuated ever since the Nuremberg show trials following WWII. The "Holocaust" industry has even managed to enact laws in a number of European countries criminalizing the very act of questioning the official "Holocaust" narrative. In the wider Western world, the "Holocaust" industry has made it taboo and socially unacceptable to question or think critically about this subject. Doing so jeopardizes social standing, personal relationships, economic prospects, and job opportunities. To put it simply, those promoting the officially sanctioned "Holocaust" narrative are extremely tyrannical. 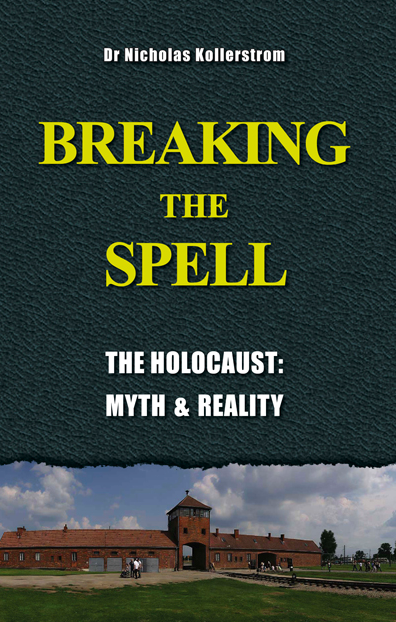 Breaking the Spell thoroughly addresses the majority of the main issues relating to the alleged Jewish "Holocaust", and includes a brilliant discussion, analysis, and summary of the chemical testing done at some of the concentration camps conducted by important revisionists such as Fred Leuchter and Germar Rudolf, which conclusively debunked the "homicidal human gas chamber" fantasy. Leuchter and Rudolf's forensic studies of the concentration camps, particularly the alleged Auschwitz "death camp", authoritatively demonstrated that the facilities that utilized Zyklon B were used for hygienic purposes, rather than homicidal ones. Zyklon B was used to delouse inmate clothing and bedding primarily, and special delousing chambers were set up for the purpose of disinfecting inmate clothing and killing disease-spreading insects. Bugs were gassed at the various German-administered concentration camps during WWII, not Jews. Dr. Kollerstrom also analyzes the so-called Bletchley Park Decrypts, which consisted of radio communications between the concentration camp administrators and German officials in Berlin intercepted and decrypted by British intelligence between January 1942 and January 1943. The intercepted communications proved that the Germans were running a network of labor and detention camps, and were doing their best to ensure safe and sanitary living conditions for the inmates. The Germans were concerned with reducing deaths at the concentration camps, not increasing them, and they certainly were not engaged in a systematic slaughter of the Jews of Europe. The "homicidal human gas chambers" story, and the general narrative of brutal, barbaric persecution and murder of European Jewry, was largely a result of a Jewish propaganda, public relations, and fundraising campaign going back to the WWI era, which was designed to generate sympathy and money for organized Jewry, in addition to Allied anti-German atrocity propaganda spread throughout the war. Following WWII, countless "Holocaust survivors", the iconic and truly horrific "Holocaust" imagery (all of which is entirely taken out of context and/or misrepresented), German "confessions" (extracted by torture) and other manufactured "evidence" produced at Nuremberg, and Hollywood propaganda solidified the false "Holocaust" narrative in the West. The most ironic thing about the false "Holocaust" narrative is that it is virtually the exact opposite of what the Jewish community and mainstream political establishment would have us believe. The Germans did not have a policy to systematically murder the Jews of Europe (a fact "Holocaust" historians have even had to admit). In reality, they did everything in their power to keep Jews alive in the various concentration camps because they needed a productive and reliable labor force to support the war effort. On the other hand, Jewish intellectuals, propagandists, and public policy makers in the West and Soviet Union openly declared their intention and desire to annihilate the German people. And that's exactly what happened during and after WWII: the German people and their allies experienced a real holocaust - a real genocide - not the Jews. Folks, it is finally time to break the "Holocaust" spell! It is time we all started using our brains properly - thinking critically about all subjects, however taboo, remaining skeptical, and independently investigating and verifying all information we consume - no matter the source. I was on Dr. Jim Fetzer's The Real Deal radio program this past Monday, where we discussed Dr. Kollerstrom's book and some of the conclusions I've come to regarding the false Jewish "Holocaust" narrative of WWII. You can download the mp3 file here, or watch the YouTube video below. According to a recent report published by The Algemeiner, a Jewish online news website, just over 1.5 million people visited the Auschwitz-Birkenau "death camp" over the course of 2014, with roughly 70% of the visitors under the age of 18. The "Holocaust" industry has made it a priority to specifically target vulnerable and extremely naive youngsters with their insidious propaganda and public relations ploy. The highest number of visitors ever recorded bore witness to the European Holocaust at the Auschwitz-Birkenau death camp in Poland, the Museum and Memorial Center reported Friday. “The Auschwitz-Birkenau Memorial has become the world’s symbol of the Holocaust and the crimes of World War II,” Director Dr. Piotr M.A. Cywiński, said. The latest statistics mark the largest number to visit any memorial site in Europe, and about 70 percent of 1,534 million visitors to Auschwitz were under 18, according to officials. “Without the reference to the history of this place it would be hard for new generations to understand our reality and challenges of the contemporary world,” according to Cywiński. Poland, with 398,000 visitors recorded, led the list, followed by Great Britain (199,000), the US (92,000), Italy (84,000), Germany (75,000), Israel (62,000), Spain (55,000) France (54,000), Czech Republic (52,000) and South Korea (41,000). Thanks to the courageous efforts of a number of heroic and honest historians, we now know that virtually every aspect of the officially promoted and sanctioned "Holocaust" narrative is entirely false, particularly as it relates to the supposed Auschwitz "death camp," which was in reality a massive concentration camp whose inmates supplied much needed labor to the industrial facilities in the surrounding area. The notion that millions of Jews were murdered by "homicidal human gas chambers" at Auschwitz is nothing more than a crude, nonsensical propaganda story sold to the public by the mass media, Hollywood, official government pronouncements, and alleged "Holocaust survivors," whose very existence proves the official "Holocaust" narrative is false. Visitors to Auschwitz will not be told that the official death toll dropped from 4 million murdered at the "death camp" to just over 1 million in the early 1990s, where even the 1 million figure is extremely dubious. Visitors will also not be shown the swimming pool located at Auschwitz, or told that the inmates were allowed to organize and attend plays, musical performances, sporting events, and religious services. Visitors will not be told that the German administers of the camp were ordered to protect the camp inmates and not physically abuse them in any way, as their labor was needed for the war effort. Visitors will not be told that German policy in the various labor and concentration camps under their administration, including Auschwitz, was formulated to provide safe and sanitary living conditions for the inmates. The "gas chambers" we hear so much about were in reality delousing chambers, where clothing and bedding were disinfected and cleaned to prevent the spread of typhus and other deadly diseases. No, the visitors to the Auschwitz "death camp" will be propagandized and indoctrinated with the fake Jewish "Holocaust" narrative of WWII, a weaponized aspect of our collective history designed to advance international Jewry's global agenda. Promoting the fake "Holocaust" narrative of WWII ought to be considered psychological and intellectual terrorism.